Both the Boyer-Bransden MKIII and the Micro Digital are intended primarily for motorcycle use. 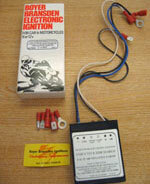 However the Inductive Discharge Unit which is inexpensive to buy and extremely simple to fit is ideal for anyone wishing to improve the running of older, classic or high mileage cars, or motorcycles, with traditional coil and distributor ignition, 6 or 12 volts, positive or negative earth. Just four connections and timing worries and sparking at the points are a thing of the past. Points life is extended beyond 30,000 miles and more energy reaches the spark plug for improved combustion and m.p.g. Often the improvement in efficiency is made immediately apparent by an increase in idle speed. This can be corrected by simply turning down the idle adjustment on the carburettor. Normal electronic rev counters are unaffected. For more specific information see fitting instructions for KIT00070 positive earth or KIT00069 negative earth. This unit is designed to control the ignition voltage within a range of less than 100 rpm and can be present over the range of 3000 rpm to 15000rpm. The system will allow the engine to produce full power up to the set rpm figure and then the ignition voltage will be sharply reduced, allowing the engine to hunt over a very narrow rev band. The adjustment of the rev range is by a 20-turn screwdriver adjuster with anti-shear limit stops. This is sealed by an o-ring and is vibration proof. Clockwise rotation increases the rev limit; counter-clockwise reduces it. Units have 5 year warranty. Can be used on some cars with contact breakers, contact us for further info and single coil wiring.